The armed forces need to stay abreast of changes and maintain a strategic edge when it comes to defence. This translates to a constant evolution of your suite of ground combat vehicles, sea craft, aircraft and troop-carrying vehicles. At SafeSmart we understand that with new equipment comes the requirement for an array of different support and maintenance gear. Safe access to specialist machinery often calls for innovative solutions – platform stairs, maintenance stands, GSE, work stands, work platforms, ladders, gangways, and temporary bridges – all built to specification. Build upon solid foundations. Your defence is only as strong as your maintenance equipment. Keep machinery ready and equipped with SafeSmart's suite of height access platforms. SafeSmart has a global reputation for excellence with assignments tendered by the military. Beyond local projects, our products have seen applications within defence programs in the United States, South East Asia, New Zealand and Australia. 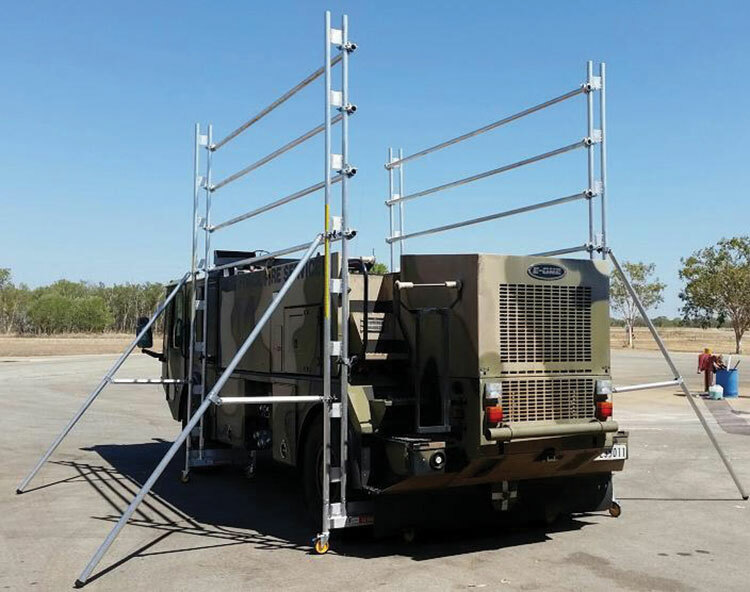 Our team has consulted with high-ranking acquisition personnel, designing and manufacturing custom top quality portable access equipment for boats, aircrafts, land vehicles and more. The SafeSmart team has a complete understanding of defence force etiquette and requirements. We apply a keen understanding of your objectives to each of the solutions that we craft. Learn more about our custom height access solutions and the learning journey we undertake to ensure that our specialist products or other custom work platforms achieve the results you're looking for. Give us a call or enquire online to begin the conversation.